I'm going to be honest, I've recently become footballed-out. Yep, I'm not "the cool" girlfriend who enjoys watching football on the weekends and having to live my life around the playing schedule. Don't get me wrong, I root for my teams (Huskies and Seahawks) and I'll watch the big games (and even enjoy them). BUT EVERY WEEKEND FOR MONTHS ON END?!?! I'm over it. 2. The Giants made it to the Super Bowl!!! This is the boyfriend's team and therefore my secondary team. The Seahawks were out a long time ago, so I've been trying to be "the cool" girlfriend by supporting my man and rooting for the g-men. Usually this means me sitting on the couch next to him while the game is on reading food magazines but it's the thought that counts, right?! And I am actually excited that they made it to the biggest game of the year. It's something I can get amped up about and it's an excuse for me to make fun treats for us while we watch the game. Also, our good friend Tom is a die hard Patriots fan. It's sure to be a good game considering the last time they were in the Super Bowl together, the Giants stole the Patriots undefeated season for a win, oooooooo! Wanna see how the bet between the boys turned out last time?! Sorry Tom. 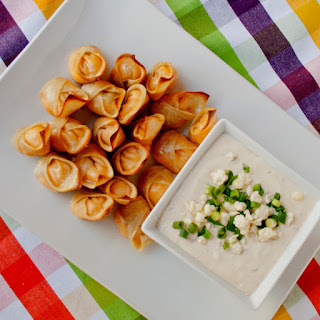 I love these won tons because they have what I call the wow factor. Something that sounds fun and tastes good.I hope you enjoy them. 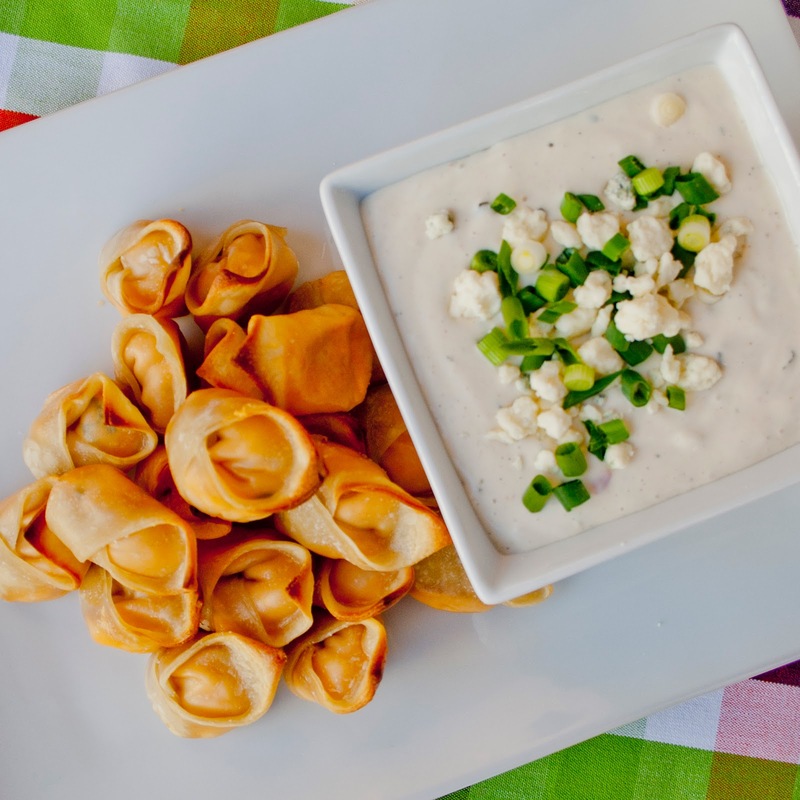 What's on your menu for the Super Bowl this year? yields about 50 - 60 wontons. Packages vary by weight, not count which is totally weird. 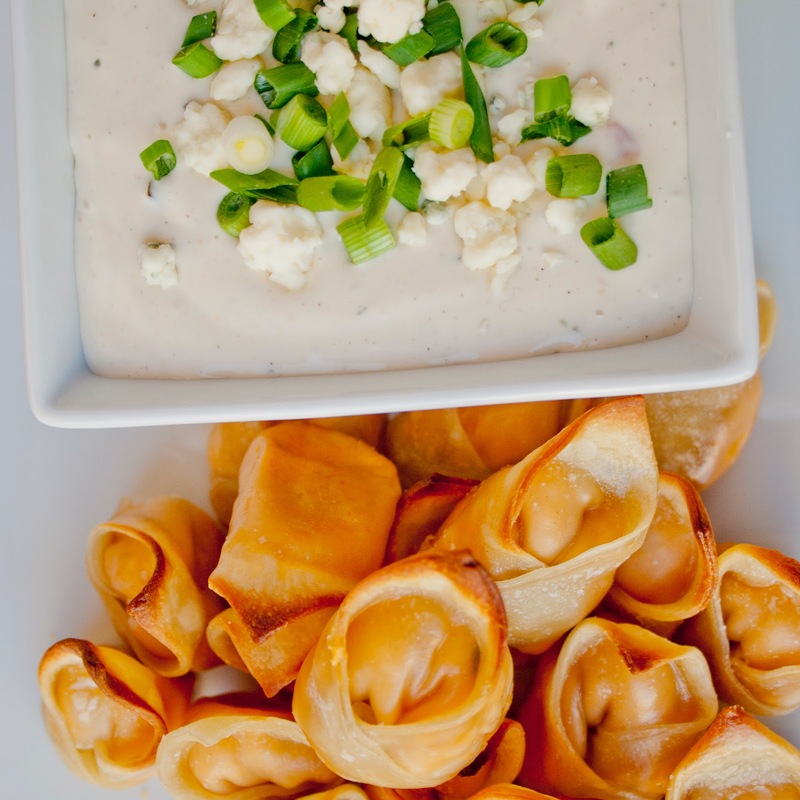 You'll have enough filling for about 60 wontons. Preheat oven to 400º F. In a mixing bowl, add cream cheese, chicken, blue cheese crumbles, franks sauce, and chopped green onions. Combine until thoroughly mixed. If you want, you can combine it in a food processor to make it quicker. I would add the chicken chunks about halfway through if you're doing it this way. Next, get a small bowl of water and set up your assembly station (wrappers, mixture, water bowl, baking sheet). Take a damp paper towel and place it over the wonton wrappers - you don't want them drying out while you're making them all. Now to assemble. 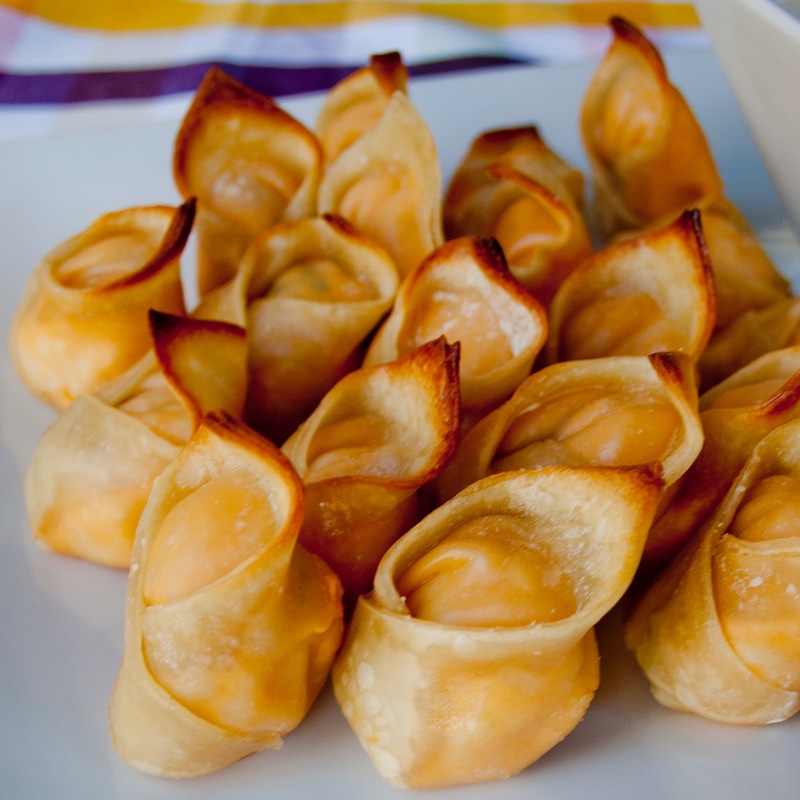 Place ½ TBSP of the chicken mixture in the center of the wonton. 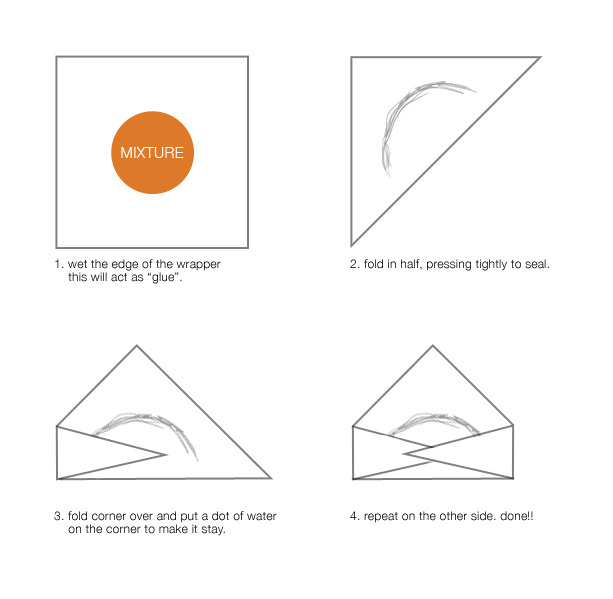 Gently rub a little water around 2 of the edges and fold to make a triangle. Press the edges tightly to seal them. If the mixture comes out of the seam, you know you have a little too much filling in there, use a little less of the mixture. Next fold one corner into the center and the other corner on top of that. You may need to secure those corners with a small drop of water too. Place on a parchment lined baking sheet. Repeat for the next 59 wrappers. Place in the refrigerator for 15 minutes to cool. Then bake for 15 - 20 minutes until the outside is golden brown. Serve with celery and carrot sticks and a side of ranch or blue cheese. Eat any leftover mix with some tortilla chips. you can use canned chicken, or cook up some chicken thighs instead or do a dark/light meat combo. to save time you could buy a rotisserie chicken and just shred the meat, then you're guaranteed nice juicy chicken. or you could use ground chicken or turkey as a last resort. you can use any kind of "wing sauce" you like. franks is a classic which is why i used that but i think going forward i'd use my own hot sauce. also, green onions are optional. i think the richness of the mixture needs a little sharpness to cut through it. if you don't have any you could use chopped celery instead or leave it out. if you wanted to be indulgent, after-all, it IS the super bowl, you could fry these babies in some oil. these can also be made a day or two ahead of time and then baked right before serving. just make sure you store them in an air tight container with a slightly damp paper towel to keep them from drying out. you could even pop them into the freezer and defrost and serve as you want... this is a very easy recipe, it just takes a little time to fill and fold all those wrappers! too much work to wrap all those won tons? i don't blame you... it's not for everyone. if you can't be bothered, try making buffalo chicken dip instead! use one less chicken breast and add a little heavy cream or half and half to thin the mixture up a bit. place in a casserole dish and bake in the oven at 350º F for about 20 minutes until it becomes bubbly and warm. serve with pita or tortilla chips and carrots and celery sticks. dip away! thanks jessie! i'm glad you like the blog! i hope you enjoy the recipe! I made these for a bunch of friends last weekend. They were FANTASTIC! Rave reviews from everyone who tried them. My compliments Morgan! Curious, if needing to make these ahead of time...do you refrigerate, freeze or are they something you have to bake immediately? Great question! I have done both. I noticed when I refrigerated them the day before serving, that they were a bit greasier and had a bit more chew (they didn't crisp up as well). Out of the freezer they actually get even crisper in the oven! So it depends on if you like a bit of chew or more crunch. Just be careful if you freeze them to not over-cook. A few of mine busted open. They still tasted great but they weren't as pretty. Let me know if you have any more questions! I'm making these this weekend for a bridal shower. I'll post again after I see the reactions from guests! Can these been made the day before and stored in the fridge or should they be made day of? I noticed when I refrigerated them the day before serving, that they were a bit greasier and had a bit more chew (they didn't crisp up as well). Out of the freezer they actually get even crisper in the oven! I guess it depends on if you want maximum crunch or something a little closer to a chewy potsticker. If you want crispier, I would make them day of or just freeze them. Just be careful if you freeze them to not over-cook. A few of mine busted open. They still tasted great but they weren't as pretty. Let me know if you have any more questions! That sounds like a lovely trip. Looks very nice to eat. Just enjoy any of the GENTING CASINO slot games in our Poker Casino from Friday to Sunday. If luck should not be on your side this time, then all you need to do is contact our customer support team and they will credit your cashback instantly to your account.Claim your 35%to 100%via e-mail, phone or live chat by quoting our slot cashback offer!